Little Bishop Pendant Light Hooks are designed specifically for drop pendant lights. 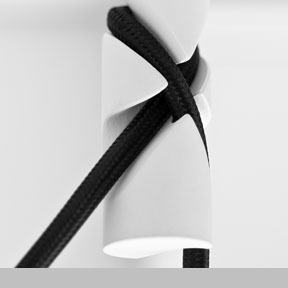 Skillfully shaped and cast by hand, the lighting cable is guided to "cloak" Little Bishop with no knot, and a seamless hang from the ceiling defines its form and function. Little Bishop is a two-piece product with a post and a hook joined by a custom screw fitting that allows for the hook section to be positioned at any angle relative to the direction of the cable coming from the ceiling rose. Three lengths are easy to install or retrofit.